The first thing: This is not Oppenheimer's first rodeo with Microsoft. As the rest of the Nasdaq heads south this morning, shares of Microsoft (NASDAQ:MSFT) are heading north -- up 0.5%. For this, you can thank the friendly analysts at Oppenheimer. As reported on StreetInsider.com this morning, Oppenheimer has just assumed coverage on Microsoft stock with an "outperform" rating -- the equivalent of a "buy." That alone sounds like pretty good news, but if you look at Oppenheimer's recommendation more closely, it might be even better news than it seems. You see, while Oppenheimer is calling this recommendation an assumption of coverage, in fact, it's nothing of the sort. According to our records here on Motley Fool CAPS, Oppenheimer first began recommending that investors buy Microsoft stock back in late 2008 -- and it has not wavered in its enthusiasm since. Over several years of ups and downs, Oppy stood firmly behind Mr. Softy. As a result, it's enjoyed market-trouncing returns of 267% over the past seven or so years -- nearly 97 full percentage points better than the profits on the S&P 500 index. 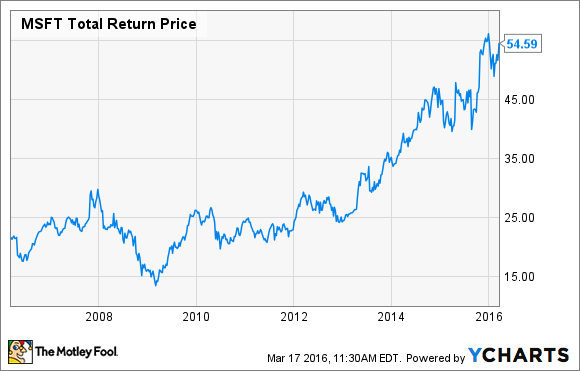 Despite downs and ups, Microsoft has been rewarding investors for years. MSFT Total Return Price data by YCharts. That's an impressive record of success. But what does Oppenheimer think of Microsoft today? Here are three things you need to know. Key to Oppenheimer's buy thesis on Microsoft today is the analyst's opinion that "MSFT's vision of a mobile first, cloud world ... [is] the right strategy ... to be at the forefront of the next generation of computing." According to Oppy, "communications and cloud services continue to converge," and that means mobile devices (smartphones and tablets) aren't really different devices from PCs and laptops at all. Rather, all of these devices are just different access points to the Cloud, and any of them may be accessed by users at any time. Accordingly, a company that uses one single operating system on all of its compatible devices has an advantage over anyone else who doesn't. That's Oppenheimer's story, and they're sticking to it. What's more, Oppenheimer is convinced that Microsoft has bought into this story as well, and "instead of fighting the inevitable shift to the cloud, MSFT is fully embracing it ... using the power of the cloud to introduce an overall better operating system (for both developers/customers) which works across all Windows devices." And now Oppenheimer goes way out on a limb to argue that "MSFT will be successful in driving the only true unified hybrid cloud platform" (emphasis added). Not Alphabet (NASDAQ:GOOG) (NASDAQ:GOOGL). Not Apple (NASDAQ:AAPL). That assertion, and the "outperform" rating it supports, may not be as crazy as they sound. While I fully expect Alphabet and Apple to continue evolving their Google Chrome and iOS operating systems, devices using those operating systems will never work quite as "seamlessly" in conjunction with Windows as will Microsoft devices using the same operating system across all products. And with half of the businesses on the planet continuing to use Windows at the office, this is a strong argument for Microsoft's operating system taking market share from its rivals. But how strong is Oppenheimer's argument in favor of buying Microsoft's stock? Is it really a better buy than Google or Apple? Let's take a quick look. With $24 billion in free cash flow generated last year (according to data from S&P Global Market Intelligence), Microsoft shares currently cost just 18 times trailing free cash flow. That's a whole lot cheaper than the company's purported P/E ratio of 39, which is derived from counting only GAAP net income as "profits." Factor Microsoft's $57.4 billion net cash hoard into the picture, and the stock's enterprise value to free cash flow ratio is even cheaper, at just 15.6. With a 2.7% dividend yield and a 10.4% projected long-term profits growth rate, I'd say Microsoft would be an obvious buy at about 13 times free cash flow -- somewhat less so at today's 15.6 times FCF. Now let's turn to the competition. Alphabet is growing at 16%, pays no dividend, and has an enterprise value of about 26 times free cash flow. That's pretty pricey. Finally, at an enterprise value to FCF ratio of less than 10, Apple stock has the cheapest valuation of all -- but Apple is also projected to grow the slowest of all -- S&P Global analysts say 10% annually over five years. Unlike Alphabet, though, Apple does pay a dividend (2%). Long story short, I still see Apple as the cheapest stock of these three. And with the lowest expectations for growth on Wall Street, it's got the lowest hurdle to clear to deliver an upside surprise. Google is much more expensive and has the highest expectations to fill -- a tall order on both counts. It's somewhere in the middle. Not quite the buy Oppenheimer believes it is, but just as clearly not a sell.